As a professional, freelance artist for the last 15 years, I have been trained or self taught in many different mediums. The daughter of a successful dress maker from Southern California, I grew my passion for creative hand work and fabrication at an early age. Aside from spending my summers combing for natural treasures at the beach, I could also be found at my mother’s studio, helping to embellish her custom couture designs with sequins and rhinestones. I learned the art of sewing and grew a deep appreciation for fashion, fabrics and the techniques of combining texture with color. I grew to have a disciplined eye for simplicity and to honor the given beauty in all that is natural. This early beginning mentored many creative abilities in me and stands as the inspirational base from which my designs take form. My love of nature, color, texture and embellishment is present in most all the art works that I create today. Working with my hands has always dominated my inspirations as an artist and I have utilized this focus in many creative fields through out my career. This infusion of interests has developed my artistic techniques, embraced the many facets of my art and has shaped it into a unique style that is truly my own. 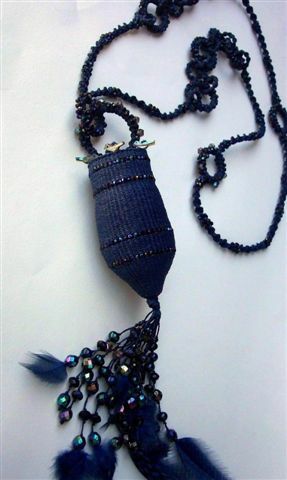 My love of hand made jewelry has been my main focus for the last 15 years and in 1998, I incorporated weaving and contemporary basketry into my work. Through these art forms the spirit of my art is created and transformed into beautiful, alluring designs to be worn, adored and treasured. I am soft, a weaver of thread. All photography and art works are protected by Copyright © 2008 Trisha Edge Dalziel Artworks and Design.